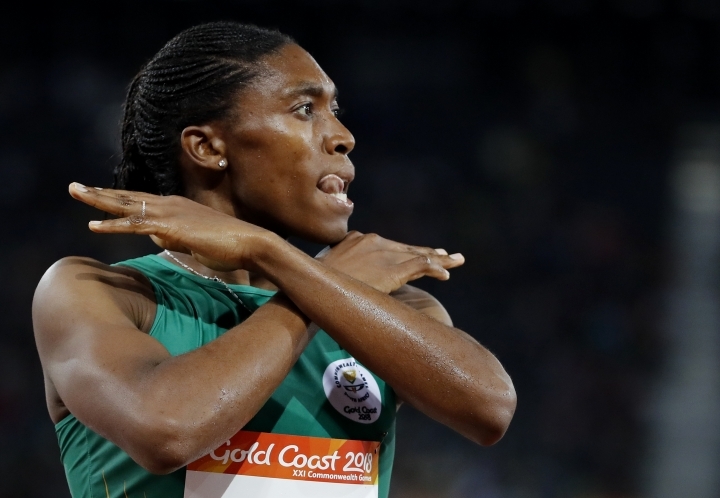 GOLD COAST, Australia — Caster Semenya didn't let a light drizzle and technical malfunction prevent her from setting the Commonwealth Games record in the 1,500 meters. The two-time Olympic 800-meter champion crossed in 4 minutes, 0.71 seconds, taking more than four seconds off the old mark. That came after a 12-minute delay at the start because of a technical fault, and a slower-than-usual first two laps from Semenya. She started her surge with 250 meters to go and rounded the leaders with 200 remaining, extending her lead in the home stretch and then flexing her biceps in a bodybuilding pose after crossing the line. Next up could be gold in her specialty, the 800, as well. 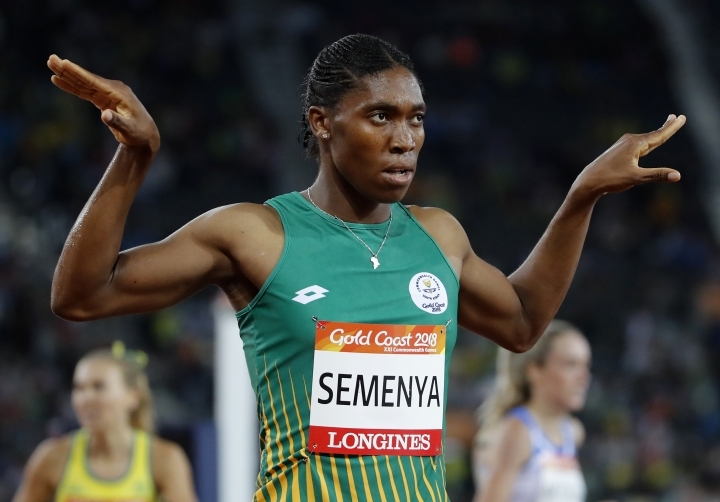 "It's difficult to balance speed with endurance, but with 10 years of experience for me now I'm ready for anything," Semenya said of her prospects of winning over both distances. "I'm more confident that I know how to run in fast races and slow races, to muster the kicks and make sure I'm in the right shape, because I can't always run in front." 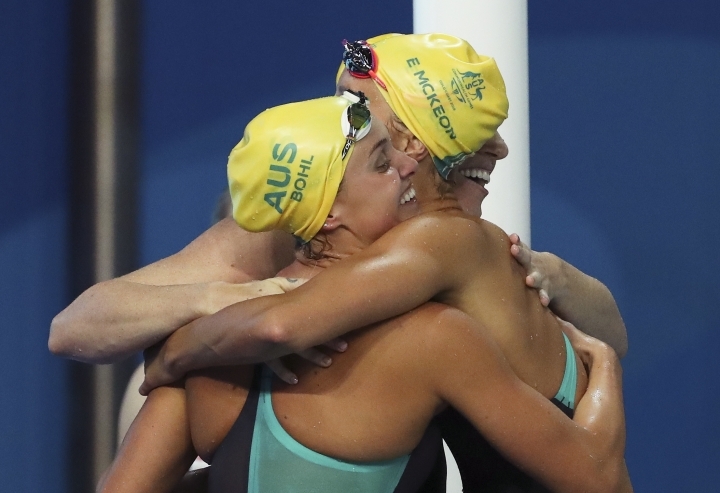 There was yet more gold for Australia along with personal milestones for South African Chad le Clos and Canadian teenager Taylor Ruck. Australia added six more gold medals Tuesday to finish with 73 medals — 28 gold, 21 silver and 24 bronze — in swimming events. Ahead of the last night of competition, le Clos won gold in all three butterfly distances — the 50, 100 and 200, and had a silver in the 100 freestyle. Those four medals had increased his career Commonwealth Games total to 16, a record for a swimmer, and two fewer than the record 18 overall held by two shooters. Le Clos made it 17 when South Africa won bronze in the medley relay. The 17-year-old Ruck finished with eight medals at these Games, breaking a 52-year-old Canadian women's record. Canadian Elaine Tanner won seven medals (four gold and three silver) at the 1966 edition in Kingston, Jamaica. Ruck had one gold, five silver and two bronze medals on the Gold Coast, picking up her eighth medal when Canada finished second in the medley relay. British shooters also filled the podium in the men's 50-meter rifle prone — David Phelps of Wales took gold, Neil Stirton of Scotland won the silver and Kenneth Parr of England took the bronze. It was Phelps' second gold of the games, and on his 41st birthday. India won the other shooting gold, with Heena Sidhu taking the women's 25-meter pistol.